You no longer have to choose between the light weight of mesh and the light-blocking benefits of a solid cover. 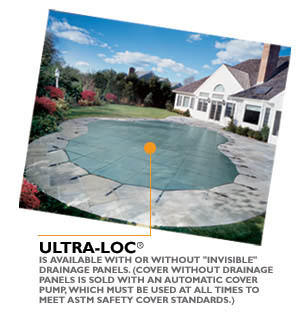 ULTRA-LOC – the revolutionary new type of safety cover exclusively from LOOP-LOC – gives you the best of both worlds! 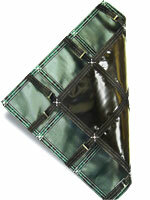 33% LIGHTER IN WEIGHT than typical solid vinyl cover material! STAYS TIGHT & BEAUTIFUL year after year, in any weather! 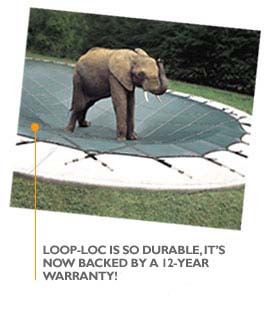 ULTRA-LOC is so durable, it's backed by a 12-YEAR WARRANTY! SO REVOLUTIONARY, IT'S PATENTED! Utilizing a patented process, ULTRA-LOC’s advanced material is fabricated by adding a proprietary solid copolymer coating to LOOP-LOC’s famous lightweight but incredibly strong mesh. No More Back-Breaking Maintenance. Unlike solid waterbag covers, a LOOP-LOC requires no pumping, scrubbing or heavy maintenance. And it's much lighter in weight than typical solid vinyl covers, so putting it on and taking it off your pool is a snap! A Perfectly Beautiful Fit Every Time. LOOP-LOC's exclusive Computer Aided Design assures a perfect, custom fit for any shape or size pool. 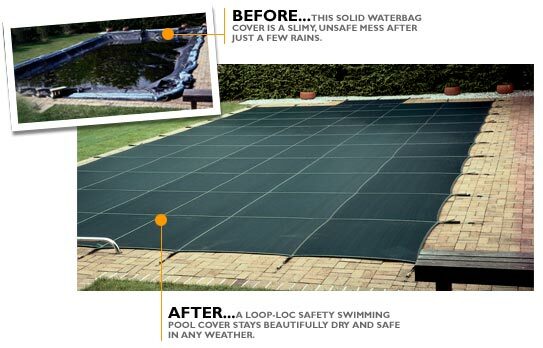 A LOOP-LOC always stays tight, clean and beautiful on your pool - unlike saggy, unsightly solid waterbag covers! From a simple square, to a complex installation, LOOP-LOC can manufacture a custom cover with the perfect fit for any pool or spa. And a LOOP-LOC cover will blend beautifully into any backyard decor, with your choice of standard spring green or optional black, blue and gray designer colors. 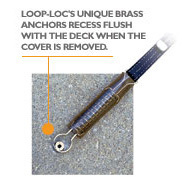 Built super-strong and securley anchored into the deck, LOOP-LOC puts an unbreakable "lock" on your pool to protect your family. And only LOOP-LOC comes with the patented SAFEDGE and GAPGUARD Child Safety Intrusion Barrier. It closes the dangerous gaps created where raised obstructions meet the cover's edge, so there's no way children or pets can slip through! No More Slimy Swamp In Your Backyard! Solid waterbag pool covers become a dangerous, slippery swamp after just a few rains. LOOP-LOC's fine mesh allows rain to drain through. The cover stays dry and beautiful in any weather! Warranty! All LOOP-LOC mesh and solid safety covers come with a 12-year pro-rated manufacturer's warranty. When completed and signed by the original purchaser, this warrants that the cover is free from defects in material and workmanship under normal use.